A joint World Heritage Centre/ICOMOS/ICCROM Reactive Monitoring mission was carried out in April 2015 (the mission report is available at https://whc.unesco.org/en/list/707/documents). On 25 November 2015, the State Party submitted a state of conservation report; a summary of which is available at https://whc.unesco.org/en/list/707/documents. Coordinated measures have been implemented for visitor management and to accommodate both tourism and religious practices. Overall, the property is in a good state of conservation and restoration projects are continuously being implemented to address the vulnerability of the fabric of the component parts. Prevention measures against fires, a high disaster risk, are in place, along with additional monitoring of the soil erosion and bedrock conditions of the main Palace; measures are in place to anticipate potential structural stability issues. The finalisation and approval of the CHCP will be crucial to have a precise roadmap to address long-term challenges, but also to identify an overarching conservation philosophy for the three component parts of the property. The efforts made to protect traditional building techniques and ensure the involvement of artists and craftsmen from the region are particularly noteworthy and showcase the importance of promoting traditional knowledge systems to sustain the Outstanding Universal Value (OUV) of the property. The conservation plans should make provisions to ensure that these practices are continued and fully integrated into the management arrangements. Regulatory measures and implemented projects such as the Old Town Protection Project are essential to improve the current condition in the buffer zones of both the component parts and their wider setting. Furthermore, strong enforcement of the regulatory measures is needed, given the rate and extent of development currently being experienced at Lhasa. Clear provisions are needed regarding acceptable heights, visual qualities, façades, and roofs, among other aspects. As recommended by the 2015 reactive monitoring mission, the Urban Master Plan should take these aspects into account and promote the spatial linkages and visual corridors between the component parts, the historical context and the wider setting that give Lhasa its unique character. Additionally, care should be exercised in maintaining the traditional urban structure and layout in the buffer zone. The Urban Plan can also be complemented with a Cultural Environment Management Plan to provide complementary measures. Development proposals should be subject to Heritage Impact Assessments (HIAs), and attention should be paid to historically important archaeological sites. A coordinated development permit system should be in place to ensure the adequate enforcement of existing regulations; these aspects need to be further defined in the Urban Plan for the property, which will be developed and adopted by all stakeholders and management entities to avoid situations such as the telegraph tower which impacts the visual characteristics and predominance of this Palace on the landscape. 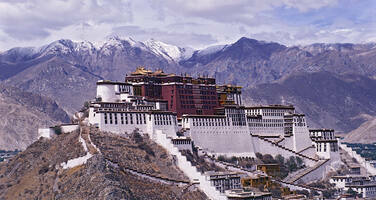 Furthermore, the sacred context of Lhasa, which is still a significant pilgrimage area, needs to be thoroughly articulated within the management arrangements for the property. This may potentially entail compromises with the increased tourism demands, but this essential attribute of the property warrants particular attention. Finally, in accordance with Decision 33 COM 8B.47 (Seville, 2009), the State Party was requested to resubmit a boundary modification proposal for the delineation of buffer zones for the three components of the property, in order to align them with the boundaries defined at the time of inscription. The State Party was also requested to provide scaled maps and details of height restrictions for the three buffer zones, taking into account the protected perspectives. On 28 March 2014, the State Party confirmed that they would define the three buffer zone boundaries as inscribed in 1994, 2000 and 2001 respectively. Scaled maps need to be provided through the formal boundary clarification process, together with details of regulations for height restrictions. Also requests the State Party to submit to the World Heritage Centre, by 1 December 2017, an updated report on the state of conservation of the property and the implementation of the above, for examination by the World Heritage Committee at its 42nd session in 2018.